Workplace Foster Care is a pawsitively brilliant idea! Studies and polls agree that a pet-friendly workplace can decrease stress, improve morale and productivity, reduce absenteeism and increase staff retention rates. No more awkward ice breakers that shy newbies dread, or cheesy team-building activities - pets are a natural conversation starter and have an incredible gift for putting people at ease. And, by welcoming a rescue pet into your workplace, you won’t just be helping that one pet. You’ll be raising awareness of fostering for all pets in need and freeing up space for rescue groups to save even more lives. PetRescue supports more than 950 independent rescue groups nationwide and we will help pair you with compatible rescue groups participating in the PetRescue Workplace Foster program. This will ensure there’s always a furry foster pet available to start bringing some joy and love into your workplace. For all the info you need to convince your staff or boss that this is a pawsitively brilliant idea for your business, download the FREE guide to our Workplace Foster Care Program, or contact us to get started. 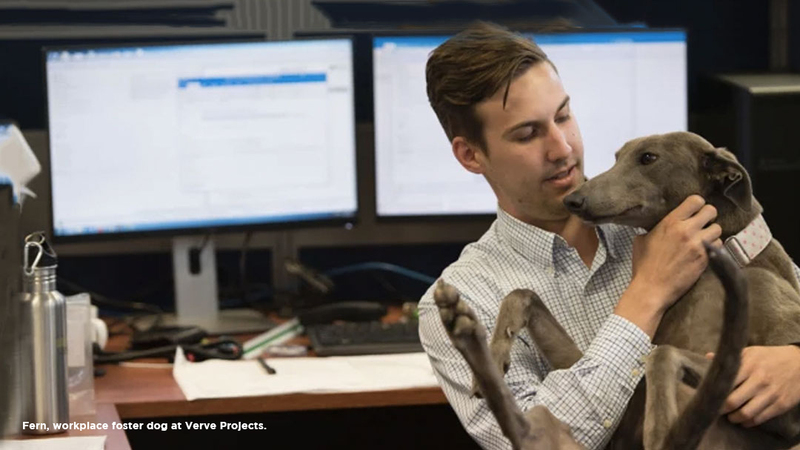 Our pet-loving friends at Vinomofo were the very first company in Australia to participate in our Workplace Pet Foster Care Program in 2015, and since then many others, including PETstock, MARS Petcare, Verve Projects and Vanilla Sugar, have been inspired to welcome a foster furry into their workplace too. You can find the latest Workplace Foster updates on our Facebook page. Download your FREE guide to our Workplace Foster Care Program today and get involved.